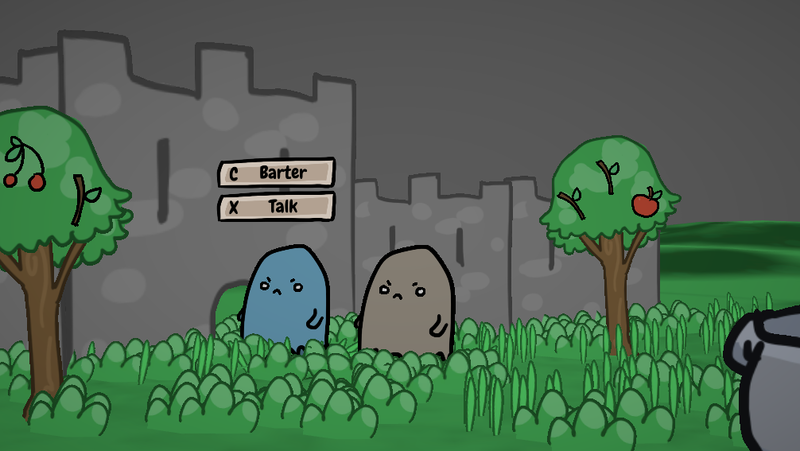 I made a little crafting game for Ludum Dare 33 called A Crown of My Own and was really happy with how it turned out, so I'm working on a larger-scale project to try and capture some of the same feel and mechanics but in a much much bigger, fuller, and more varied world. I'm aiming for a relaxing, peaceful experience where you can explore, make friends with cute creatures, and discover/create all kinds of interesting items and objects. Playing A Crown of My Own will give you an idea of the kind of vibe I'm going for, and how the basics of crafting and item discovery will work (kinda). I'm very much inspired by the atmosphere of older Harvest Moon games and the feel of accumulating lots of stuff in your typical RPG. 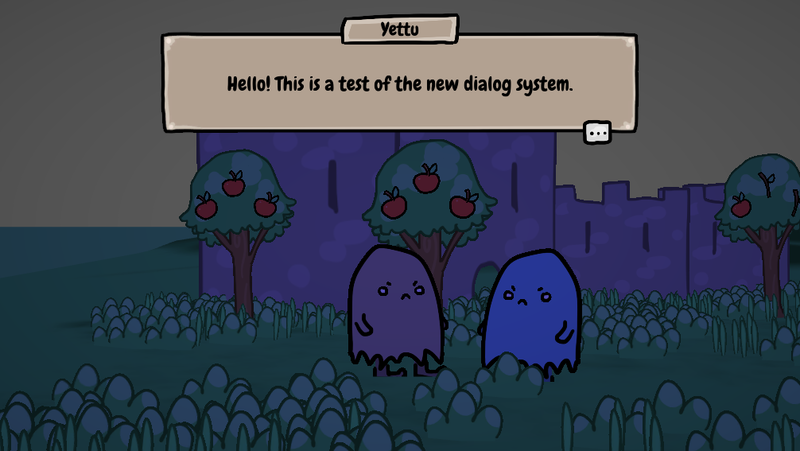 So far I've been working on a few systems like support for bigger more open levels, NPCs with pathfinding and AI deciding where to go across the day/night cycle, branching dialog, a more robust data format for items, and more. There's basically no content, I'm first working on beefing up the systems based on what I learned from making ACOMO. It's really early in this game's development (I've put maybe 2 weeks into it beyond the ACOMO jam build), but I thought I'd try to do some public updates as I progress with this game to help keep me motivated. Updates might be a bit sporadic, as this is a side project for me and I'll mostly be working on it during weekends, but I'll try to keep posting as regularly as I can! I love the gif at the bottom. Visuals remind me a little of Paper Mario. Hard black outlines, 2D sprites, and everything is cute. All it needs is a horizontal flip when you change directions. Been a while since my last post, I've been swamped with other work. 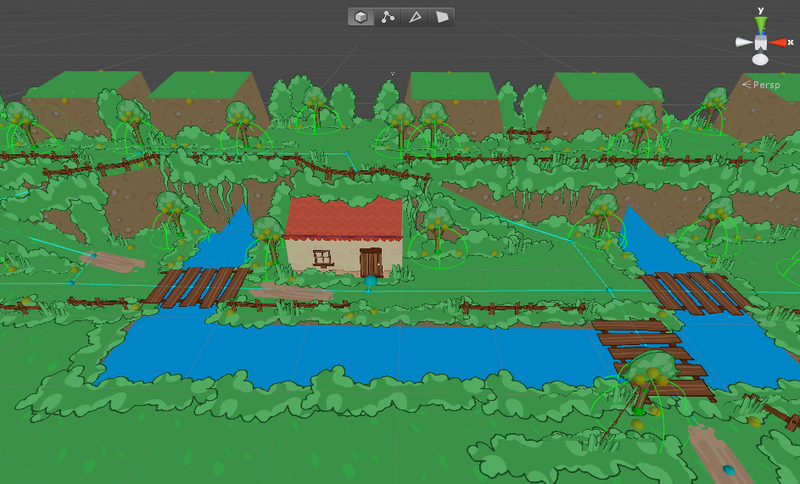 I haven't been able to do much on this game in the last couple of weeks but I did pick up ProBuilder for Unity to try building out some levels using simple meshes instead of unity terrains. I like the process with ProBuilder much much better, I just need to spend some time creating a more detailed art test environment at some point. I'm trying to find the balance I like right now between flat and 3D, how much I want the world to feel like dioramas vs. big deep physical locations. I think the approach of big blocky mesh terrain shapes with their harsh edges masked by slightly more detailed sprites is the way I want to go..
Had a little time this weekend to push my art test a bit further. The assets are really rough but overall the feel is matching what I have in my head closely enough that I think I'm going to move forward on some new features and stuff next. Slow going, but putting together this test level has given me some morale!